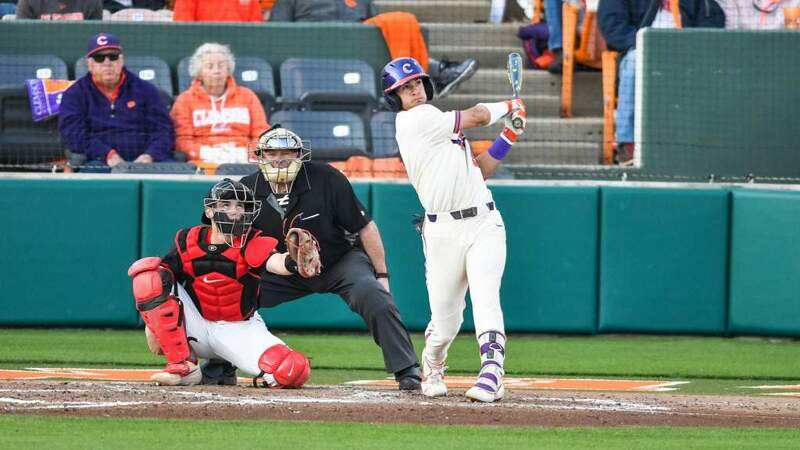 Kyle Parker went 3-for-4 with a home run and #20 Clemson scored six runs in the fourth inning to rally from a 5-0 deficit to defeat North Carolina 10-6 in front of 5,118 fans at Doug Kingsmore Stadium in a game that started Saturday and was completed on Sunday due to inclement weather. The Tigers, who evened the series 1-1, improved to 25-15 overall and 11-9 in the ACC. The Tar Heels fell to 24-17 overall and 7-13 in ACC play. 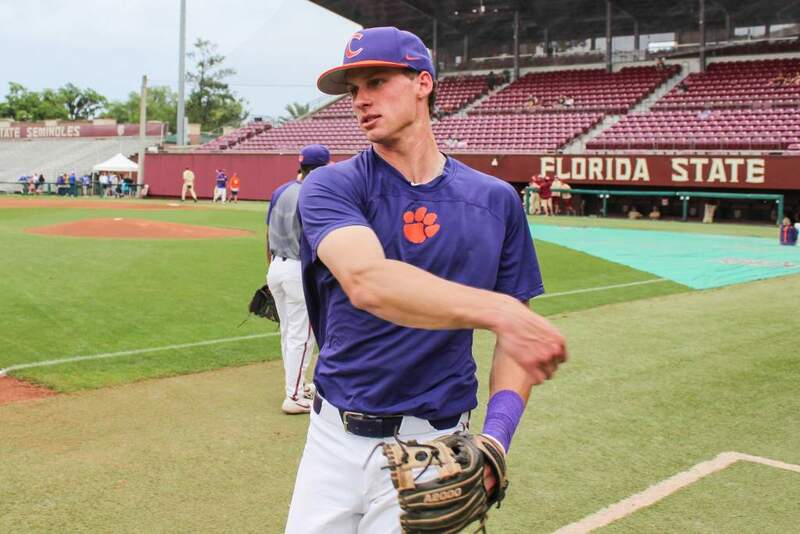 Alex Frederick (1-1), the second of four Tiger pitchers, earned the win, as he pitched 1.2 hitless and scoreless innings. Will Lamb struck out the only batter he faced to record his first save of the season. Michael Morin (5-2), the third of five Tar Heel pitchers, suffered the loss. He allowed two runs on two hits in 1.1 innings pitched. The Tar Heels took the game’s first lead in the second inning. Dillon Hazlett hit a one-out single on an 0-2 pitch to right field, moved to second on a wild pitch, and scored two batters later on Seth Baldwin’s two-out single to center. North Carolina added to its lead in the top of the third inning. Mike Cavasinni led off with a bunt single and Ben Bunting followed with a single to left. Levi Michael later walked with one out to load the bases, then Cavasinni scored on Brian Goodwin’s walk on a 3-2 pitch. Two batters later, Tommy Coyle laced a two-out double to right field to score Bunting, Michael, and Goodwin. In the bottom of the third inning, Addison Johnson followed with a walk. 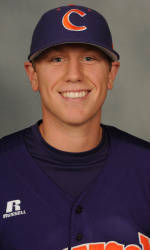 After Mike Freeman grounded into a 6-4-3 double play, Jeff Schaus reached on an infield single to second to score Shaffer. The Tigers scored six runs in the fourth inning to take the lead. Will Lamb single through the left side. Lamb then scored all the way from first base on a single to left-center by John Nester. With one out, Johnson reached on an infield single and Freeman laced a double to left-center to score Nester. Schaus’ groundout to second plated Johnson to tie the score. Parker gave the Tigers the lead with an opposite-field, two-run homer to right field, his 16th long ball of the season. Play was halted at the end of the fifth inning on Saturday at 1:00 PM due to inclement weather. Play resumed on Sunday at 12:00 PM with the Tigers leading 7-5. 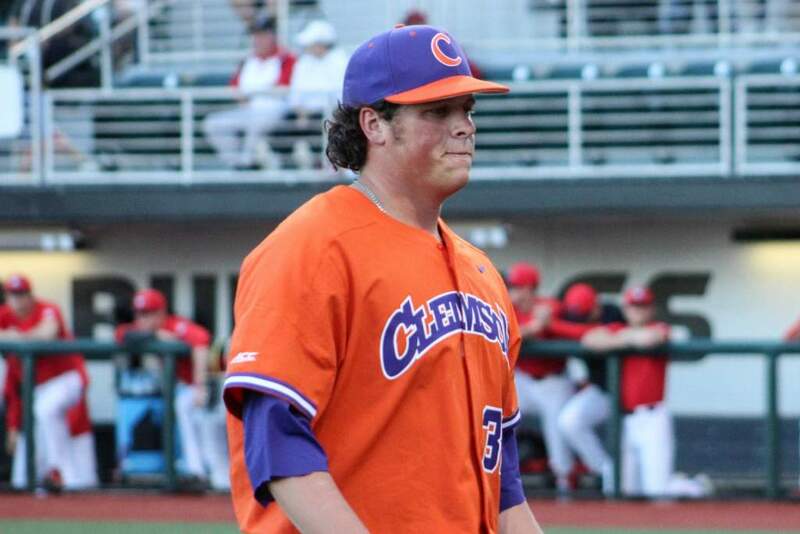 In the sixth inning, Clemson doubled its lead. Parker drew a two-out walk and scored on John Hinson’s double to right-center. After Hinson advanced to third on Miller’s infield single, Hinson scored on a balk to up the Tigers’ lead to 9-5. Michael led off the seventh inning with a double down the right-field line, moved to third on Goodwin’s flyout, and scored on Hazlett’s groundout. In the eighth inning, Hinson walked with one out, stole second, and scored on Miller’s single up the middle. 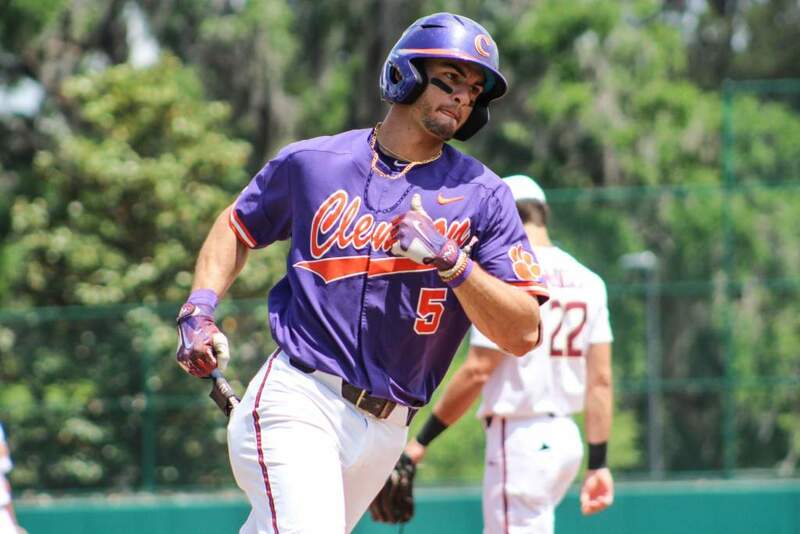 Parker led Clemson’s 13-hit attack with three hits and two RBIs, while Miller and Lamb had two hits apiece. Every Tiger starter had at least one hit as well. Bunting had a team-high three hits for North Carolina, who also had 13 hits in the game. Coyle added a game-high three RBIs. Clemson and North Carolina will play the series-finale on Sunday at approximately 1:50 PM.